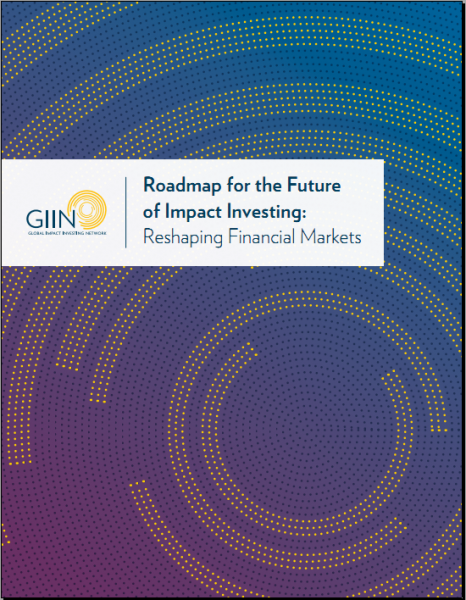 presents a vision for more inclusive and sustainable financial markets and articulates a plan for impact investing to lead progress toward this future. Specifically, the Roadmap details six categories of action to drive progress toward the vision. For each category, the Roadmap describes specific actions needed, which stakeholders should lead on these actions, and a timeframe. Enacting the plan will require collective action by leaders from the entire impact investing ecosystem. 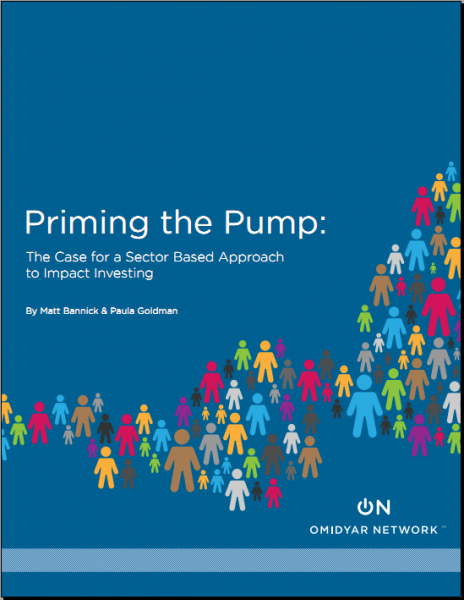 The Roadmap was developed with the input of more than 350 individuals operating in the impact investing ecosystem around the world as well as from extensive desk research into progress in the field to date. 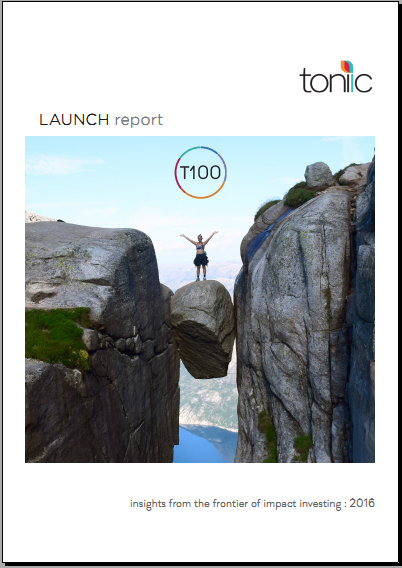 This report combines analysis of aggregated portfolios, survey data, and personal stories from participants to illuminate the 100% impact investor experience. We begin by sharing why these investors are creating more positively impactful portfolios – identifying their motivations for impact and “going all in.” We then introduce them through their personal stories, demonstrating the diversity, resolve and rigor of their approaches. Next we explore how they got started, and what processes and procedures they followed to commence their respective journeys. We then share select investment strategies and an analysis of the aggregate portfolios through the lens of entity type and asset size. Finally, we address performance, both impact and financial, before concluding with our key takeaways, and debunking of myths. 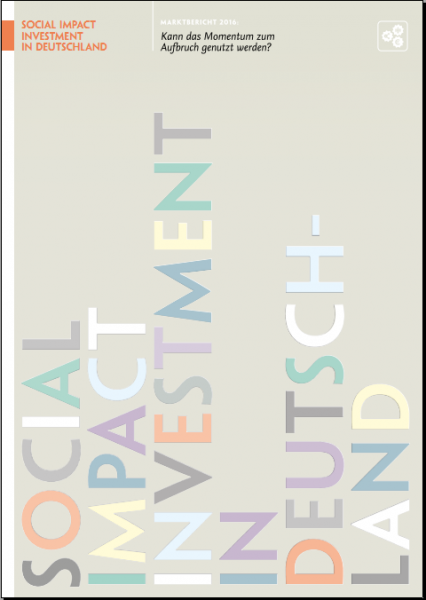 Die Publikationsreihe Social Impact Investment in Deutschland basiert auf der Arbeit des National Advisory Board (NAB), einer sektorübergreifenden und von der Bertelsmann Stiftung koordinierten Expertengruppe, die sich zum Ziel gesetzt hat, den Markt für Social Impact Investment (zu Deutsch: wirkungsorientiertes Investieren, WI) in Deutschland zu stärken. Mandatiert wurde das National Advisory Board durch die Social Impact Investment Taskforce (SIITF), die im Zuge der britischen G7-Präsidentschaft im Jahr 2013 entstand. Die Taskforce und mit ihr die National Advisory Boards in den G7-Mitgliedstaaten formulierten Empfehlungen für den Aufbau bzw. für die Weiterentwick-lung von internationalen Märkten, auf denen Angebot und Nachfrage für wirkungsorientiertes Investitionskapital effektiv zusammenfinden. In 2013, the United Nations Development Programme (UNDP), through its regional private sector unit African Facility for Inclusive Markets (AFIM), produced a flagship report on “Realizing Africa’s Wealth – Building Inclusive Businesses for Shared Prosperity”. This flagship report looked specifically at inclusive businesses in sub-Saharan Africa and introduced the ‘Inclusive Business Sector ecosystem Diamond’ framework. 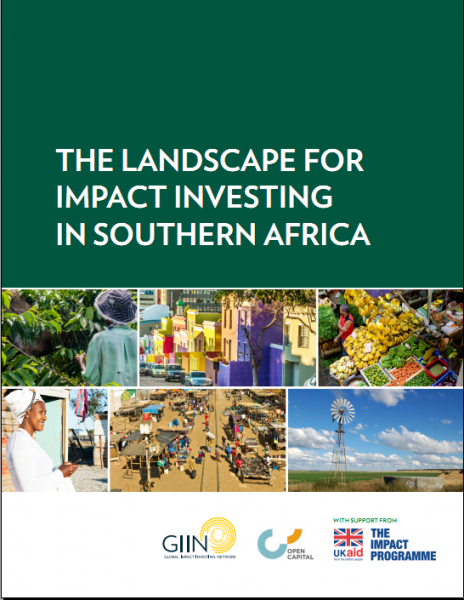 One of the key findings of this report was the need for impact investment – the allocation of capital into enterprises, funds and/or organizations with the expectation of a financial return and a positive environmental and/or social impact – to spur the growth of inclusive businesses in sub-Saharan Africa. To understand the potential for impact investment in Africa, this ‘Impact Investment in Africa: Trends, Constraints and Opportunities’ report (herein after referred to as “this report”), reviews the current overall state of impact investing in Africa, highlighting key challenges to the sector and proposes strategies to increase the flows and quality of impact investment on the continent, especially those that are African led and mobilized. 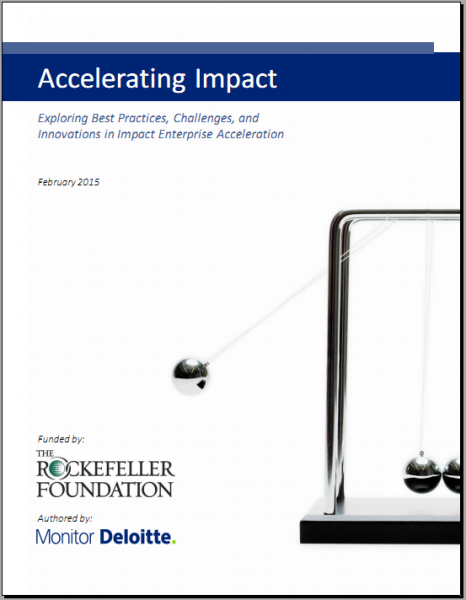 This report provides an overview of the findings from the project, describing best practices and challenges learned from accelerators themselves, while also summarizing promising, yet unproven, innovations that are currently being tested by The Rockefeller Foundation grantees. The aim is to give accelerators, researchers, and funders a qualitative understanding of “what works” and “what is promising” in accelerating impact enterprises and to highlight the key challenges that must be addressed by all stakeholders in order for the field to continue to grow. 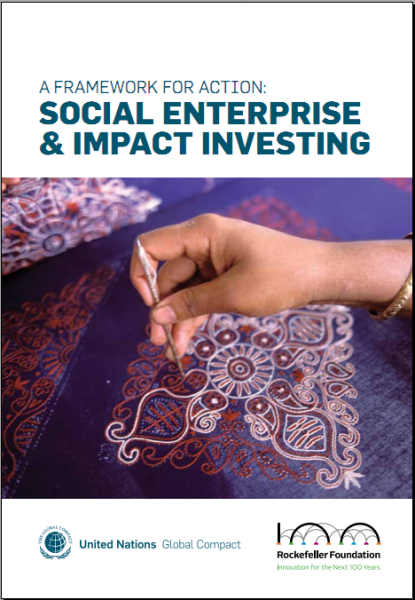 Social impact investment is the provision of finance to organisations addressing social needs with the explicit expectation of a measurable social, as well as financial, return. Social impact investment has become increasingly relevant in today’s economic setting as social challenges have mounted while public funds in many countries are under pressure. New approaches are needed for addressing social and economic challenges, including new models of public and private partnership which can fund, deliver and scale innovative solutions from the ground up. 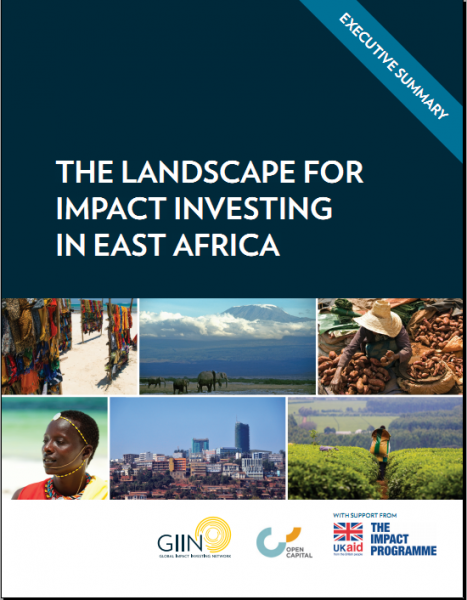 This report presents a detailed analysis of impact investing activity in East Africa, examining the supply of global impact investment capital as well as the demand for investment resources from small and medium enterprises (SMEs), social enterprises, and others who aim to drive social and environmental impact through the private sector. The report covers five “focus countries” in depth: Kenya, Uganda, Tanzania, Ethiopia, and Rwanda; and six additional countries in the region in less depth: Burundi, Sudan, South Sudan, Djibouti, Eritrea, and Somalia. 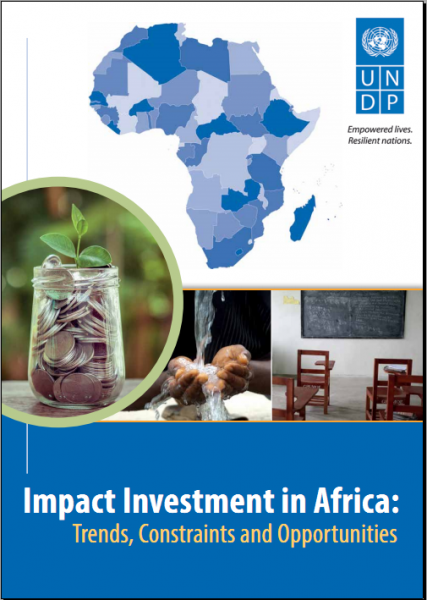 For the purpose of this report, impact investors are defined as those who invest with the intention to generate a beneficial social or environmental impact alongside a financial return—and who seek to measure the social or environmental returns generated by their investments. In the spring of 2014, NextBillion Financial Innovation editor James Militzer attended one of those conferences, the Sustainatopia Impact Conference. While there, he conducted interviews with 11 top investors, academics and advocates about their views on the sector’s vast potential, and its equally large challenges. 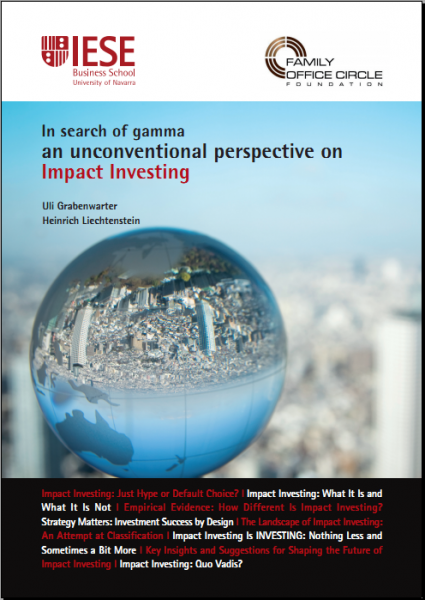 We have compiled the resulting videos into this e-book, which covers a broad cross-section of the topics and trends that drive impact investing today. 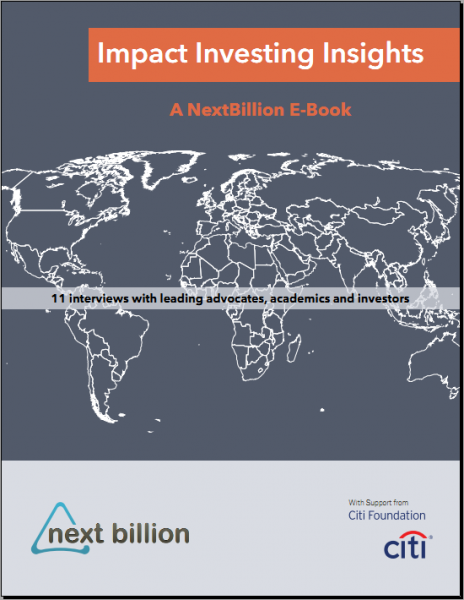 It’s the first in a series of e-books we’ll be publishing in 2015, compiling some of NextBillion’s topical series into handy resources that can be easily viewed and shared. We hope you’ll find them both interesting and informative. We are honoured to deliver to you this report together with four subject papers that provide supplementary detail on important elements of our work. Each of the National Advisory Boards also launches today its own report on what is required in its country if it is to bring impact investment to take off. 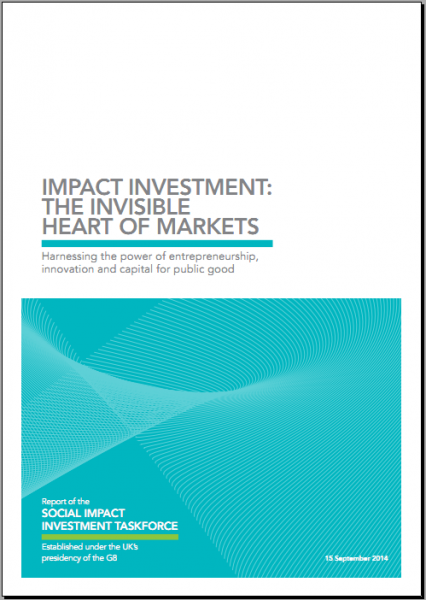 Our reports have all been written with the aim of attracting as wide a readership as possible, to include all audiences interested in impact investing. Our investigations have benefitted greatly from the insights of numerous impact-driven organisations and entrepreneurs, foundations and philanthropists, investors, businesses, government ministers and officials who have contributed their expertise and their experience to our deliberations. We are most grateful to them all. As a result, we can confirm the tremendous potential of impact investment to improve society and the environment. We note that it is already shifting the paradigm in how we think about and tackle social and environmental issues in the 21st century, in developed and in developing countries alike. The Taskforce will now continue its work for a second year to drive the take-up and implementation of our recommendations. The way in which today’s generation of sponsors and donors have earned their recognition is reflected in a broader, 21st century concept of philanthropy. In addition to classic concepts of donating, these donors and benefactors make more use of the personal skills that they have gained through employment, and of their contacts and their expertise. Hence, many have become personally involved in the charitable organizations they support. Multiple approaches to responsible and sustainable investment are also being applied to the traditional philanthropic model. 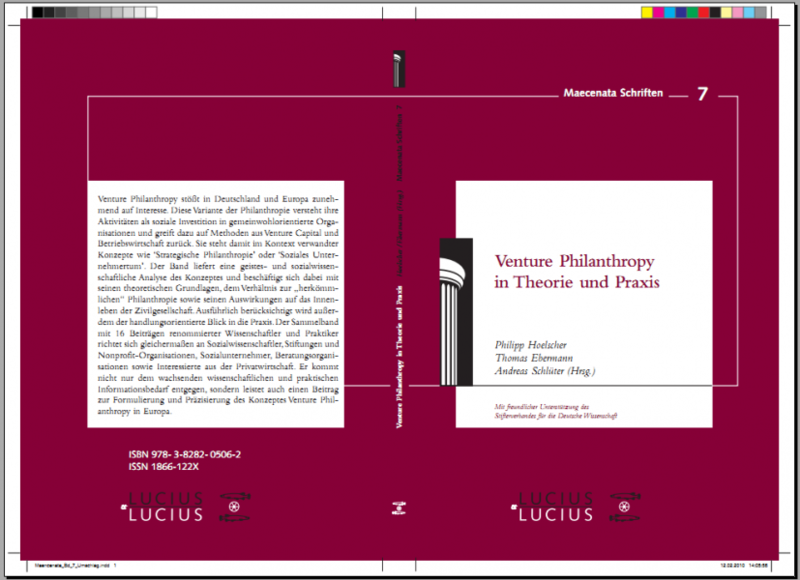 The authors of this guide have created a comprehensive and collaborative piece of work that provides an excellent overview on philanthropy for today’s philanthropists – its origins, concepts, approaches and methods. 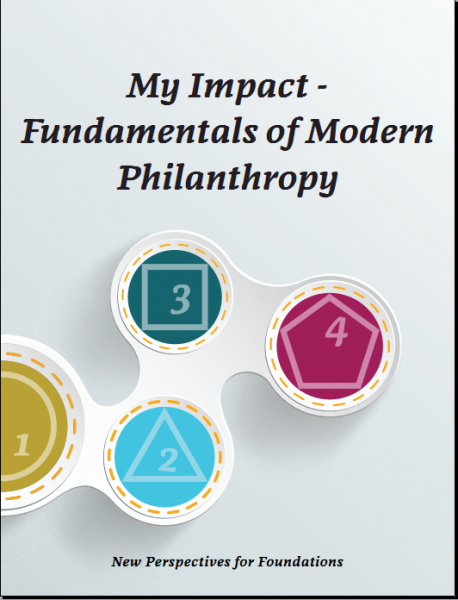 Hence, this handbook will enable the reader to gain extensive insights into key fundamentals of modern philanthropy. This guide is intended to help bring newcomers into the game. We hope it helps high net worth individuals, family offices and others to know some of the questions, if not the answers, to determine what’s right for them and what to do next to move toward meaningful, measureable impact. We kept it short and, we hope, fun to read. We developed a flexible framework and a simple taxonomy to help people get their arms around impact investing. We have also included several profiles of impact ventures, funds and investors that you can see at ImpactAlpha (impactalpha.com). 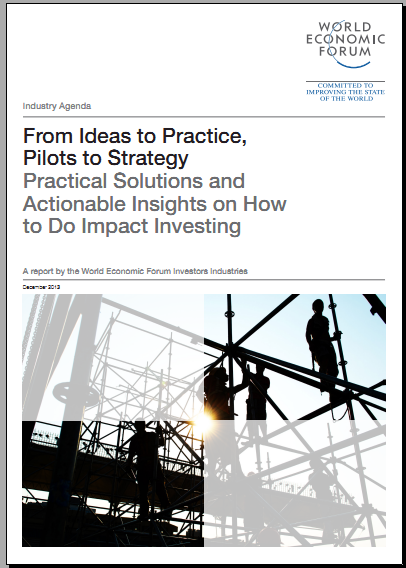 From Ideas to Practice, Pilots to Strategy is the second publication in the Forum’s Mainstreaming Impact Investing Initiative. 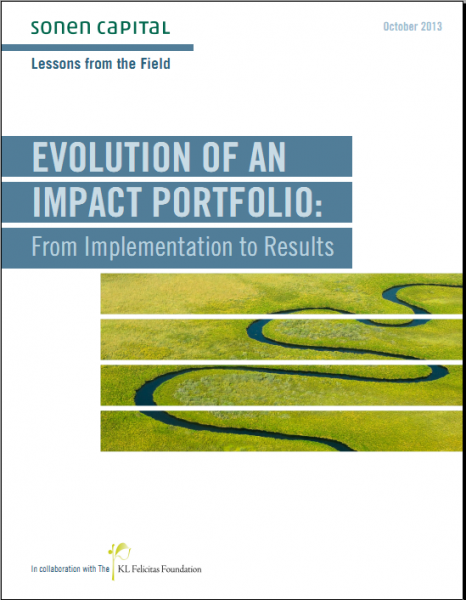 The report takes a deeper look at why and how asset owners began to include impact investing in their portfolios and continue to do so today, and how they overcame operational and cultural constraints affecting capital flow. Given that impact investing expertise is spread among dozens if not hundreds of practitioners and academics, the report is a curation of some – but certainly not all – of those leading voices. 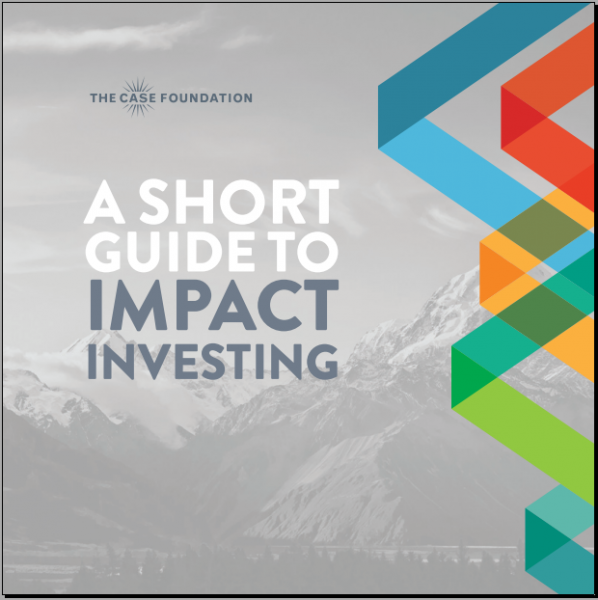 The 15 articles are meant to provide investors, intermediaries and policy-makers with actionable insights on how to incorporate impact investing into their work. 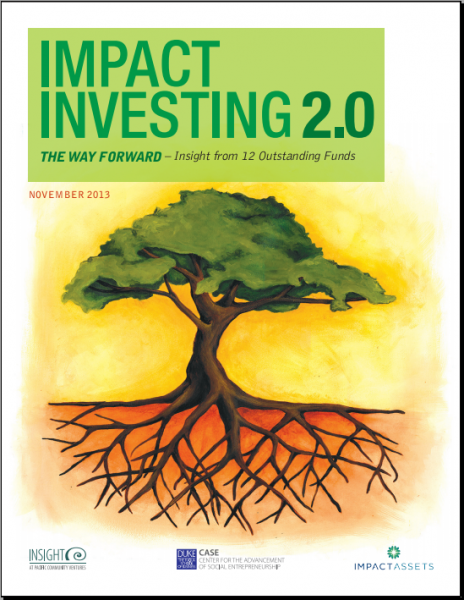 Impact Investing 2.0 represents a major step forward for the industry. The twelve funds profiled herein work in vastly different sectors, from microfinance in India to sustainable property in the UK, and have accordingly pursued very different investment strategies and approaches to social impact. Their success across such a broad set of parameters offers many lessons for the industry and beyond. There is a revolution in development finance. Private financial flows are growing, and developing countries are increasingly financing their own public services with domestic revenues. Finance from abroad is becoming more diverse, with new development partners, development finance institutions, philanthropic organisations and private investors working alongside traditional donor agencies. These new sources of finance and expertise increasingly complement the offerings of traditional development cooperation. This creates opportunities for new forms of partnership which can leverage the best that each has to offer. Impact investing – that is, investment intended to create a positive social impact as well as a financial return – has already begun to channel private sector capital and expertise into generating social benefit in richer countries. But it is early days for this kind of investment, particularly as a contribution to development finance. 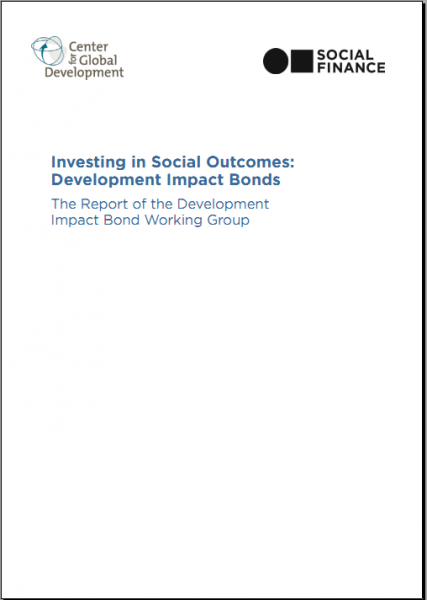 This report explains how Development Impact Bonds (DIBs) can enable more impact investment in development, by providing a shared platform for governments, donors, investors, firms and civil society to work together, achieving more in partnership than any of them could achieve separately. 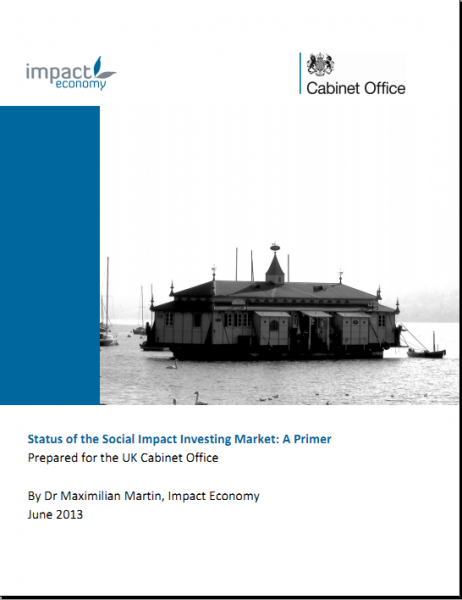 This report provides an overview of the social impact investment market. 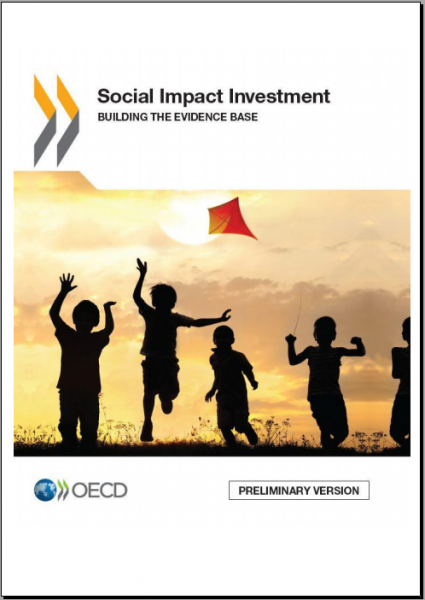 The findings are based on several research activities, including a screening of almost 200 social impact investment-related reports in the major languages of the G8, a dedicated online survey distributed to over 250 market players from around the world, and a media search of 26 terms (translated across the G8 languages) related to “social impact investment”. A companion piece provides curated suggestions from this research for further reading. 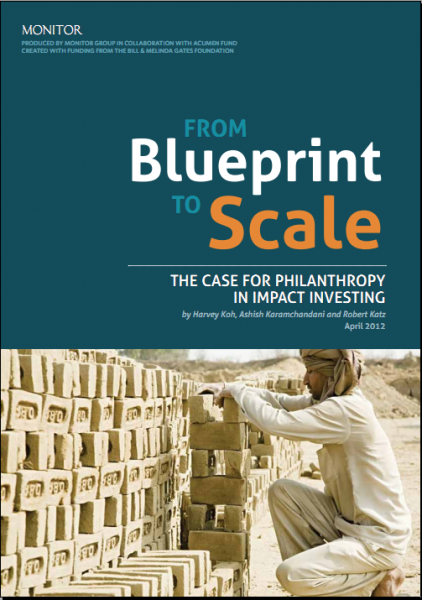 The report first describes the landscape of social impact investing and defines the term. It then places social impact investing in the broader context of three megatrends identified through the research: massive pent-up demand at the “Bottom of the Pyramid”, the need for radical resource efficiency and green growth, and new approaches to the provision of public services. The report finishes by looking at the role different groups of investors play in the market, ranging from philanthropic investors such as foundations, angel and venture stage investors, private and institutional investors, financial services institutions, and government. In 2004, in order to meaningfully address the world’s most pressing social and environmental issues, the KL Felicitas Foundation (“KLF” or the “Foundation”) made the decision to begin a process that would eventually allocate 100% of the Foundation’s capital to “impact investments” – that is, investing with the intent to generate both financial returns and purposeful, measurable, positive social or environmental impact. The Foundation determined that its needs would be met best by adhering to a return-based impact investment strategy, while taking select opportunities to introduce new concepts with impact first investments. Since KLF made this decision, the experiment has helped reshape the investment landscape by leading investors to consider a growing array of financially compelling impact investment opportunities across almost all asset classes. The early results are compelling. Over the seven-year period from 2006-2012, the Foundation moved from 2% of assets allocated to impact to over 85%, while simultaneously achieving index-competitive, risk-adjusted returns. We believe that the following performance discussion demonstrates that impact investments can compete with, and at times outperform, traditional asset allocation strategies, while simultaneously pursuing meaningful and measurable social and environmental impact. More money than ever is flowing into impact investing, yet many entrepreneurs creating companies that serve the poor still find it difficult to raise capital, particularly at the early stages of their company's growth. Seit 2005 veröffentlicht das FNG Daten zu den nachhalti- gen Anlagemärkten in Deutschland, Österreich und der Schweiz. 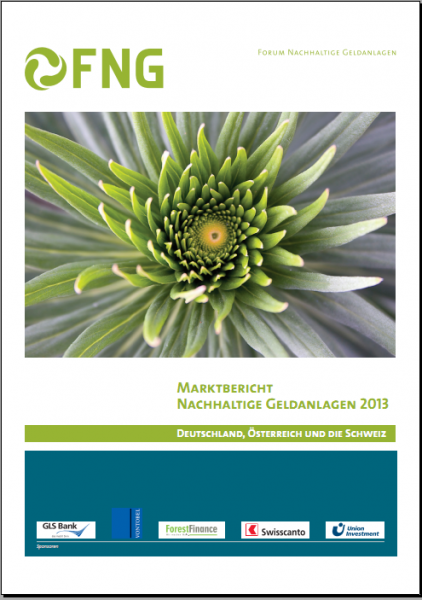 Mit dem „Marktbericht Nachhaltige Geldanlagen 2013 – Deutschland, Österreich und die Schweiz“ liegen Daten zu den drei Ländern zum Stichtag 31.12.2012 vor. Die Datenreihen können damit mittlerweile das achte Jahr in Folge fortgeschrieben werden. Die Methodik der Untersuchung ist an die europaweite Studie zum nachhaltigen Anlagemarkt angelehnt, die alle zwei Jahre vom europäischen Dachverband Eurosif (European Sustainable Investment Forum) in Zusammenarbeit mit den nationalen Organisationen (Sustainable Investment Foren, SIFs) wie beispielsweise dem FNG durchgeführt wird. 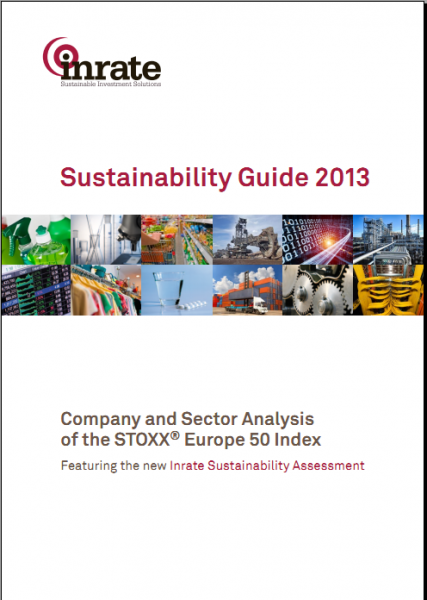 The publication of the 2013 Inrate Sustainability Guide of companies and sectors in the STOXX® EUROPE 50 index is an important step in the validation of our work. It is the outcome of a three year Research and Development project which has brought to fruition developments in our methodology we have long believed in. Sustainability analysis is often criticized, for focusing too much on the facade erected by companies rather than on the true impact of the building which lies behind it. This approach was perhaps justified in the beginning, when sustainability initiatives reflected a genuine awareness and commitment on the part of companies. But as soon as environmental and social communication became fashionable it was often the case the more the building was cracked, the more the facade was decorated. ing investments in specific industry sectors in specific geographies, and by investing in a range of organizations to accelerate the development of these industry segments. The need for investment is particularly acute at the earliest stages of innovation, which provide the foundation in which entire new sectors can emerge and scale rapidly by tapping commercial capital markets. This report springs from a point of view shared by Monitor and Acumen Fund—that philanthropy is the essential but often overlooked catalyst that unlocks the impact potential of inclusive business and impact investing. The report has been created with funding from the Bill & Melinda Gates Foundation. The key themes discussed here are based on the sum of Monitor’s extensive research into more than 700 inclusive businesses in Africa and India, and Acumen Fund’s decade of experience as a pioneering impact investor. They also draw together the experiences and observations of dozens of impact investors, grant funders, academics and other experts who were generous enough to share their thoughts with us. The combined resources of government and philanthropy alone are insufficient to solve the many development challenges of the twenty first century. Over the past decade, there has been growing recognition within the private sector of the need to take a greater and more active role in promoting sustainable development globally, through generating employment for youth, empowering women and tackling challenges related to energy, water and hunger. Corporations and investors understand the longterm benefits of contributing to development, and as such, initiatives to advance the sustainability agenda have gained strength in the recent past and will continue to play an important role in the future. However, in the quest for innovative ways to engage the private sector to bolster global sustainability further, a new approach has gained significant momentum in recent years. Impact investing is taking shape as a distinct activity, with its own unique stakeholder relationships and operational strategies. As dozens of new funds are created explicitly to tackle the world’s most intractable social and environmental problems, including over 60 globally in 2011, the diverse practices of impact investing are coming into sharper focus. We have defined evolving tensions in the field of practice as Six Dynamics, each of which describes a unique set of relationships, challenges and questions. Further investigation of the Six Dynamics will underpin a deeper understanding of the best practices required to deliver blended financial and social returns successfully, particularly for funds and their managers. 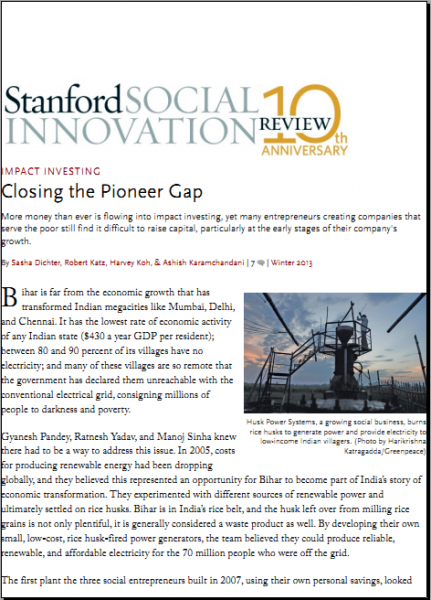 The Six Dynamics build off a simple ecosystem model of impact investing. Funds link the providers of capital (investors) to the recipients of capital (investees). Platform and financial innovation enable investors and funds to provide and deploy capital more efficiently. Venture Philanthropy stößt in Deutschland und Europa zunehmend auf Interesse. Diese Variante der Philanthropie versteht ihre Aktivitäten als soziale Investition in gemeinwohlorientierte Organisationen und greift dazu auf Methoden aus Venture Capital und Betriebswirtschaft zurück. Sie steht damit im Kontext verwandter Konzepte wie ‘Strategische Philanthropie’ oder ‘Soziales Unternehmertum’. Der Band liefert eine geistes- und sozialwissenschaftliche Analyse des Konzeptes und beschäftigt sich dabei mit seinen theoretischen Grundlagen, dem Verhältnis zur „herkömmlichen“ Philanthropie sowie seinen Auswirkungen auf das Innenleben der Zivilgesellschaft. Ausführlich berücksichtigt wird außerdem der handlungsorientierte Blick in die Praxis. Der Sammelband mit 16 Beiträgen renommierter Wissenschaftler und Praktiker richtet sich gleichermaßen an Sozialwissenschaftler, Stiftungen und Nonprofit-Organisationen, Sozialunternehmer, Beratungsorganisationen sowie Interessierte aus der Privatwirtschaft. Er kommt nicht nur dem wachsenden wissenschaftlichen und praktischen Informationsbedarf entgegen, sondern leistet auch einen Beitrag zur Formulierung und Präzisierung des Konzeptes Venture Philanthropy in Europa. 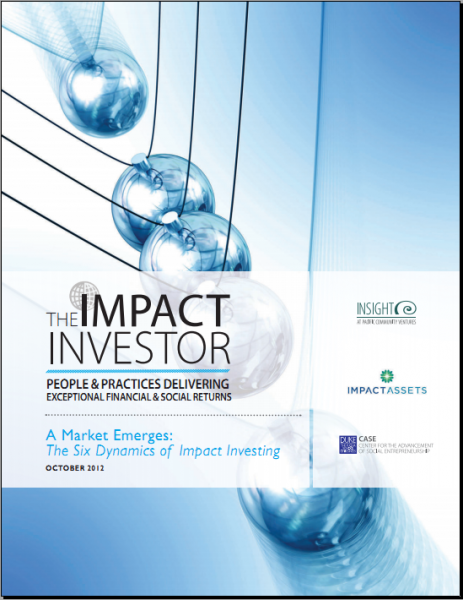 This paper summarizes the main findings from new research on impact investing supported by IESE Business School and the Family Office Circle Foundation, based on interviews with more than 60 dedicated impact investors. In it, we define impact investing, identify the diverse investors and how they have succeeded or failed and explain why the popular assumption that impact investing involves a trade-off between financial gain and social impact is wrong. In fact, one of the most striking findings from our research is that impact investing can only be called impact investing if there is a positive correlation between the financial return and the social impact. Other factors are also required to qualify as an impact investment, including the pursuit of profit and an intentional, measurable social impact. However, unless this positive correlation is evident, any investment with a social goal is simply philanthropy.